According to new research, it can heal at least 8 different cancers: cancer of skin, colon, kidney, liver, mouth, lung, leukemia and breast. There are five basic properties of turmeric that makes it an excellent natural herb for cancer treatment. It inhibits the growth of carcinogens and break down toxins present in the liver. It is very powerful anti-inflammatory which is an important defense against cancerous inflammatory cells as inflammation plays a major role in the formation and development of cancer cells. Turmeric is also a very powerful antioxidant which is 300 times stronger than vitamin E.Antioxidants provides protection against cancer by destroying oxygen free radicals responsible for causing cancer. 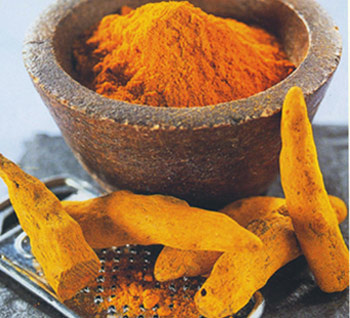 Turmeric stimulates our immune system. A healthy immune system is active in fighting off most of the diseases including cancer. Turmeric promotes weight loss by emulsifying fat as obesity increases the risk of developing breast cancer. Turmeric increases the effectiveness of chemotherapy against tumor while protecting the organs from any damaging effects. It blocks breast cancer causing toxins. Too much estrogen has been declared to be the primary cause of breast cancer. Estrogen basically attaches itself to the estrogen receptors on the breast cells which cause them to divide. Turmeric reduces the effect of this estrogen and block them from attaching the estrogen receptors present on the breast. This means that when estrogen turns on the estrogen receptors on the breasts, these receptors do not activate with high rate in the presence of turmeric effect. Turmeric also blocks an enzyme COX-2 which plays a key role in the formation of breast cancer. Turmeric is prepared by soaking and drying the root. Always use organically grown turmeric to avoid any harmful effects of pesticides and chemicals. Adding one-fourth teaspoon to soups or vegetables while cooking can give best results.